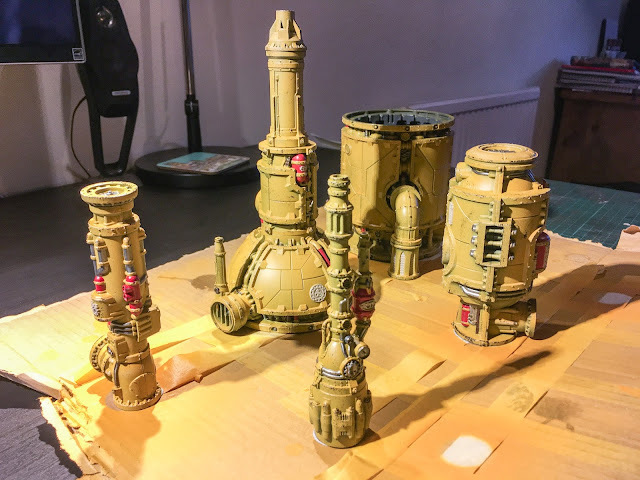 This weeks post covers an update of where I am with part of the Shadow War Armageddon (SWA) terrain. As you can see, I've split the terrain into groups based on the main primary colour being applied. In this case- Yellow! (Averland Sunset). First I'd like to cover where the inspiration came from for the colour scheme. There are loads of great example of colour schemes for the SWA terrain which looks fantastic. It was whilst in my local Warhammer store in Bath that I observed how the store manager had painted the new 40k display and loved it! 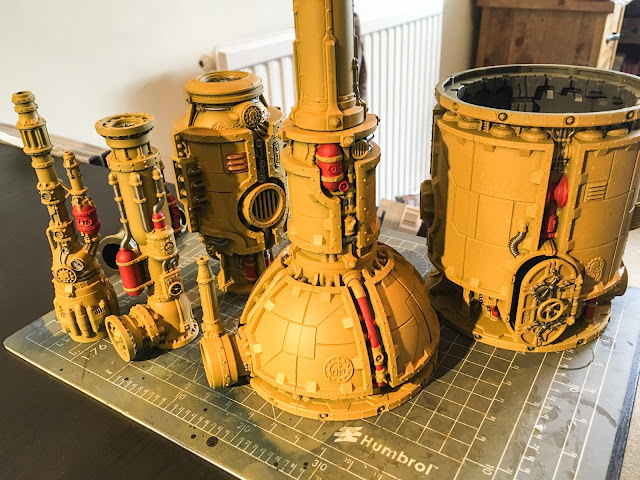 Whilst the exact scheme I am trying to achieve is not exactly the same as those shown in the photos of the display below, it made up my mind that yellow is the way to go. So, I started off my priming the terrain with Vallejo Black primer. This was possibly not the best colour to use underneath yellow as it took many, many coats to achieve any kind of decent coverage. I also experienced a few problems with my airbrush during this stage so the base coat was uneven and rather 'dusty'. Once the yellow had been built up to a reasonable level I moved on to painting the details. I picked out various details with Mephiston Red and Leadbelcher. 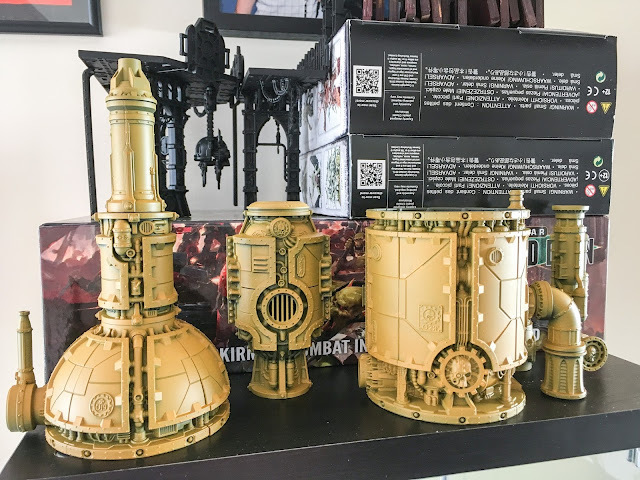 I then painted the mechanicum symbols with Chaos Black/Celestra Grey and filled in the maker stamps with Zandri Dust. 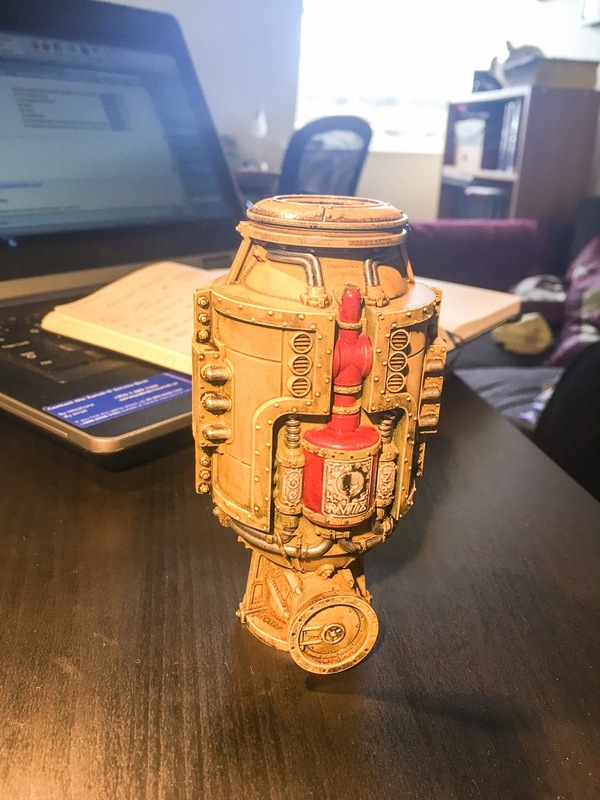 Next up was the first round of weathering- applying paint chips. I created a 50/50 mix of Dryad Bark and Chaos Black and used a sponge to apply the chips randomly across the models. Once this was completed I applied a coat of Vallejo Gloss Varnish in preparation for shading. At this point things started to go a little wrong! The plan, once the gloss varnish has dried, was to apply a mix of Agrax Earthshade/Nuln Oil gloss shade to the model. What is supposed to happen is that the gloss shade will retain more surface tension when applied to the gloss varnish and so the shade will settle in the recesses without leaving much residue on the large panels. I have used this technique successfully on other miniatures however this time the shade began to break up the gloss varnish and so didn't settle as expected. I 'solved' the problem as best I could by drybrushing Averland Sunset over the model. 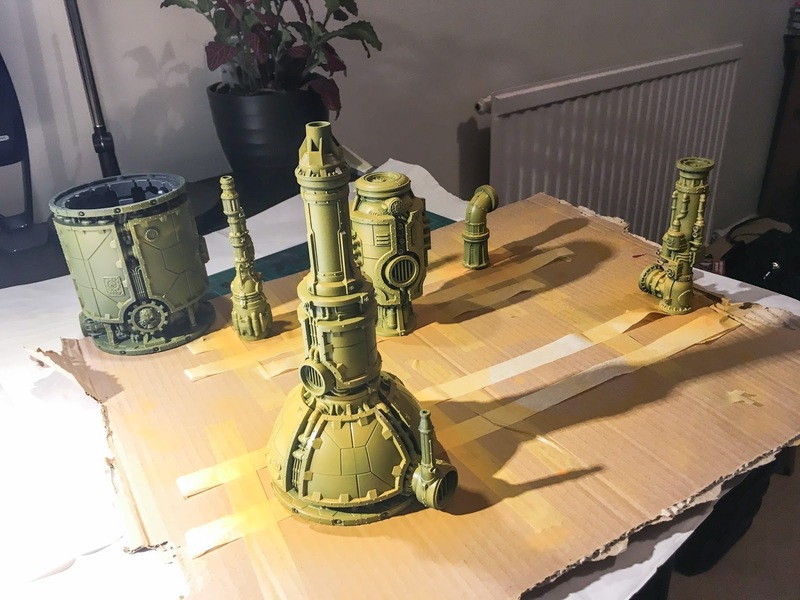 Unfortunately this resulted in the models looking chalky (as can happen with drybrushing) however, I'm content with this as its a lot better compared to how the models looked after the shade. I will continue to work on these models and will post the completed models next week.